A 30-year-old female patient comes to the ER after falling a short flight of stairs. Physical exam shows BP of 128/75, temperature of 98.5 °F, and with a pulse of 69 bpm. While taking her history she states her last menstrual period was 15 days ago. She has no significant medical history. She has minor bruising on both of her hands as she landed on them to break her fall at the occurrence of the accident. The patient states that her right hand feels weak, specifically her thumb. Pinprick test shows weak sensation around the right palmer aspect of thumb and index finger. If x-ray scans were conducted for diagnosis, which bone would show significance in damage? The correct answer is the lunate bone (B). The lunate bone dislocation in an occurrence of trauma can affect the median nerve. It presents with weakness or loss of function of the thenar eminence innervated by the median nerve. 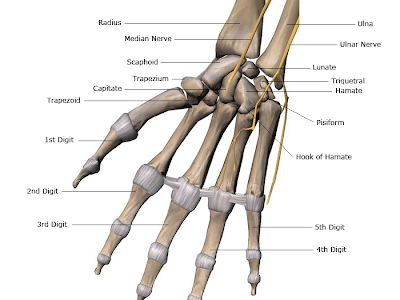 The thenar eminence is the group of muscles on the palm of the hand, at the base of the thumb. Loss of innervation of by the median nerve will lead to atrophy of the thenar eminence. The median nerve damage presents with the little to complete loss of sensation of the cutaneous area innervated by the median nerve; the palmer aspects of the 1st to the 3rd digits. The median nerve also innervates the cutaneous aspect of the distal half of the 2nd, 3rd, and the 4½ digits on the dorsal side. A) The ulnar nerve would be affected if the hamate bone was damaged. It would be presented as claw hand of the 4th and 5th digits. Also the dorsal and palmer sensational aspects to the 4th and 5th digits would be weakened or lost as well. Answers C, D, E) Dislocation of the trapezium, trapezoid, and pisiform bones would not cause significant damage to the median nerve unlike the lunate bone. In a trauma that involves the hand, if the dislocation of the lunate occurs then it will lead to median nerve damage. The affected nerve will lead to loss of sensation in the first three digits of the hand, along with loss of sensation and motor function of the thenar eminence. Loss of the motor innervation of the thenar eminence may also lead to atrophy of the thenar eminence.